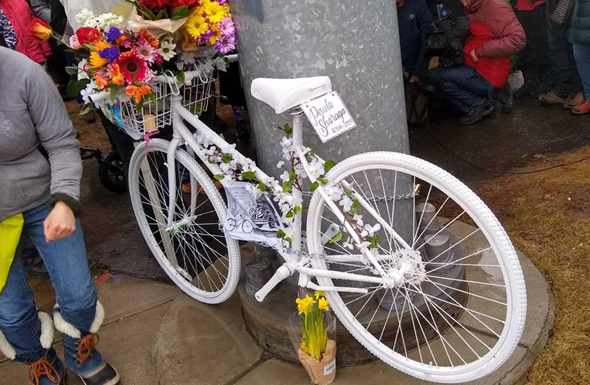 Ron Newman was among the bicyclists who attended the unveiling of of Boston's latest ghost bike, to honor Paula Sharaga, 69, a Cambridge resident and Brookline librarian, who died in a crash with a cement truck at Brookline Avenue and Park Drive on Feb. 15. Read more. State Police have identified the woman killed in a crash with a truck at Park Drive and Brookline Avenue yesterday as Paula Sharaga, 69, of Cambridge. Crash scene. Photo by Lynda Gail. State Police report a pedestrian suffered "serious injury" in the crash at Brookline Avenue and Park Drive. 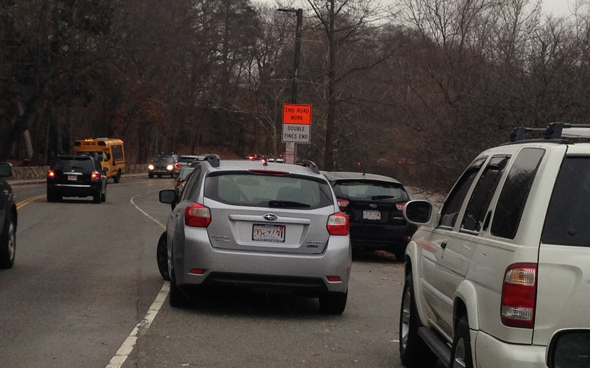 NECN reports the bicyclist, a woman, died. 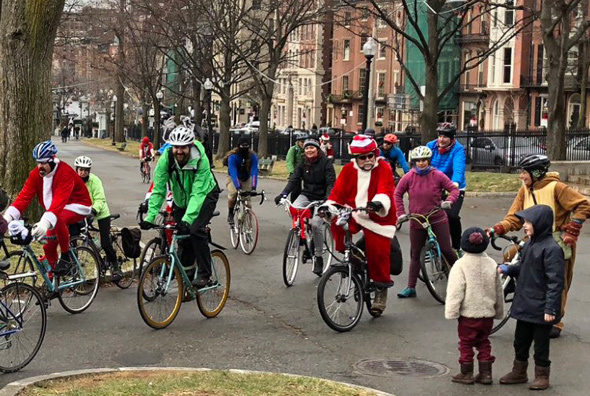 Share the road with bicyclists - ha, ha, just kidding! 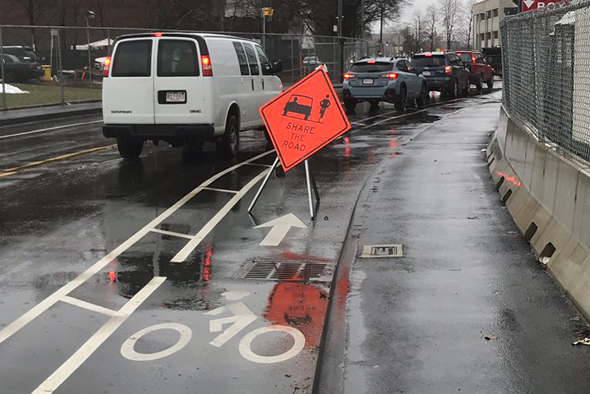 What better place to put a sign urging motorists to "share the road" with bicyclists than in the bicycle lane? Liam Sullivan spotted this sign on Western Avenue in Allston this morning. Meng Jin died on Nov. 9. 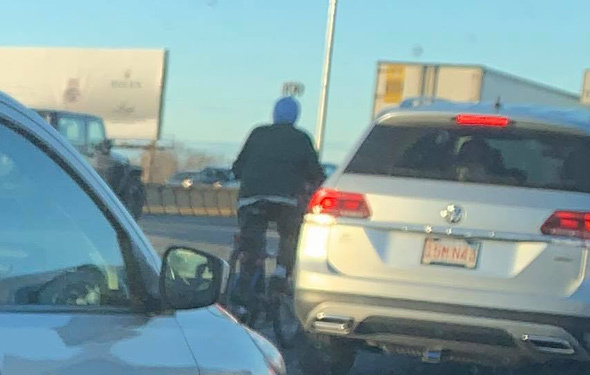 State Police report a crash around 8:15 a.m. on Monsignor O'Brien Highway at the Museum of Science between a dump truck and a pedestrian left the bicyclist dead. Read more. 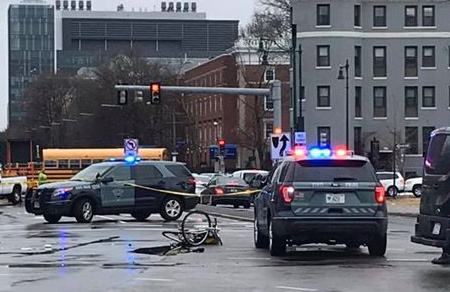 Jonathan Costa, 27, of Brookline, faces arraignment today in connection with a crash at the rotary where the Arborway and Centre Street meet, in which a bicyclist was thrown to the road, the Suffolk County District Attorney's office reports. Costa is scheduled to face charges of negligent operation of a motor vehicle and leaving the scene of a collision causing injury in West Roxbury Municipal Court, the DA's office says. Cambridge Police report an armored-car driver from New Bedford not only refused to move his wide vehicle out of a Mass. 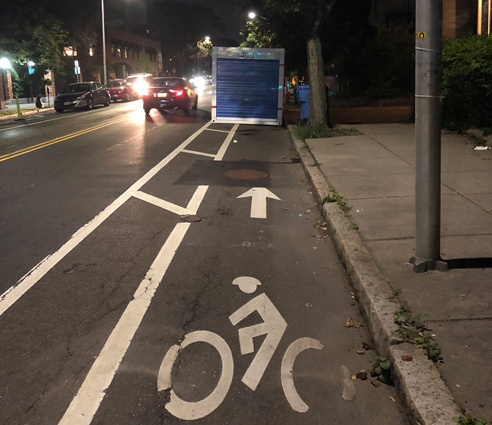 Ave. bike lane yesterday, he gave an officer some lip about it: He was arrested on charges of disorderly conduct, blocking a bicycle lane and refusing to produce his license and registration. 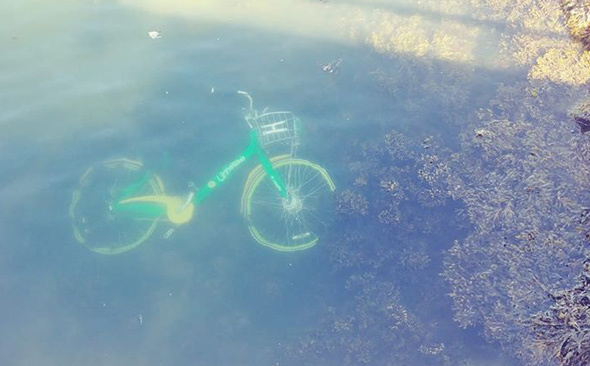 Or maybe LimeBike is offering underwater tours. In any case, Steve Holt noticed one of the rental bikes sleeping with the fishes in the water off the Harborwalk in East Boston near the East Pier development. 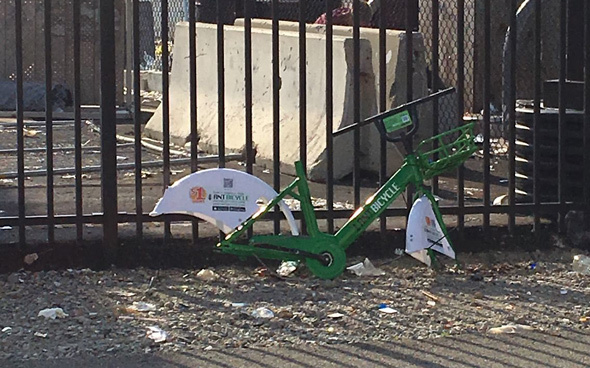 Unlike Blue Bikes, these green-and-yellow bikes from north of town are "dockless," which means people are supposed to just leave them wherever they want.